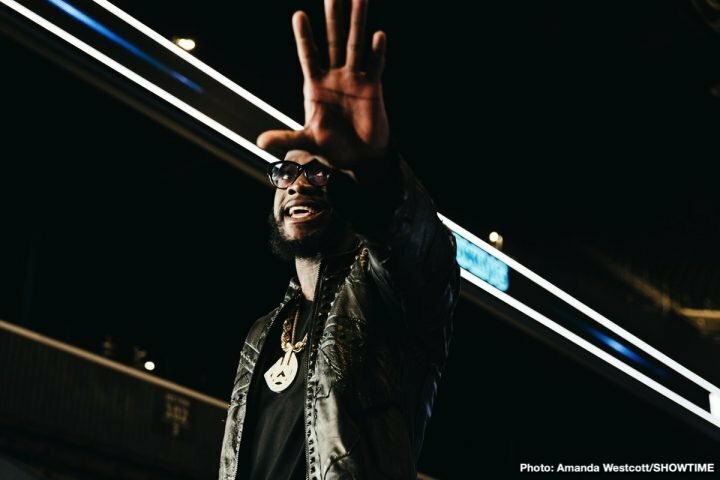 By Allan Fox: Deontay Wilder’s co-manager Shelly Finkel reportedly is looking to put together a three-fight deal for Wilder with Showtime that would pay him more than the $120 million that he was offered by DAZN for a three fight deal recently, without needing to fight Anthony Joshua. On Tuesday, it was announced at the Wilder-Breazeale news conference that Wilder (40-0-1, 39 KOs) will be fight on regular Showtime, and not pay-per-view for his next title defense against WBC mandatory Dominic Breazeale (20-1, 18 KOs) on May 18 at the Barclays Center in Brooklyn, New York. Part of the three-fight deal by Showtime would give Wilder freedom to fight Tyson Fury and Anthony Joshua on other networks. That’s a great deal, and you have to wonder whether ESPN and DAZN would be open to the same deal if Wilder were to sign with them. With Wilder fighting Breazeale on regular Showtime, his next two fights after that will almost surely need to be against the likes of Tyson Fury and Anthony Joshua to pull in the money that will balance out the money the network is paying Wilder. The real interesting part is that Wilder can get more money from Showtime for his three-fight deal than he would with DAZN, even if he doesn’t fight Anthony Joshua. That’s the real surprise. Wilder will stay loyal to Showtime with them paying him huge money for the three-fight deal. Whether Wilder can keep winning long enough to continue to make the big money from Showtime once that possible 3-fight deal is done is unclear. You can imagine Wilder will be offered more money if he beats Breazeale, Fury and Joshua. “Deontay is not locked into anyone because he would have outs [in the deal],” said Finkel. This is great news that Wilder can potentially fight on different networks in order to make the big fights against Fury and Joshua to take place. That will increase the chances of those two mega fights taking place, as long as the money split is a fair one. Obviously, Wilder isn’t about to accept a deal to fight Joshua if Matchroom Boxing promoter Eddie Hearn continues to talk about a 60/40 purse split in favor of Joshua. That’s not something that Wilder will likely accept at this point, especially if he defeats Breazeale and Fury in back to back fights. Finkel is currently in negotiations with Fury’s management at MTK Global for a rematch later this year, according to ESPN. Showtime vice president of sports Stephen Espinosa says that Wilder isn’t the one that walked away from the Fury rematch. Espinosa also says that Wilder isn’t setting a condition up where Fury and Anthony Joshua need to sign with Showtime for three to four fights in order to get a fight against him. Can you imagine for a moment if Deontay said, ‘Anybody who fights me has to sign for three or four fights with Showtime and PBC’?” Espinosa said to ESPN.com. Showtime not setting up strict conditions for the Joshua and Fury fights to take place against Wilder should help things greatly. On the flip-side, as long as ESPN and DAZN aren’t insisting that Wilder be tied to their networks for three to four fights just to get one fight against Joshua or Fury, those fights should be able to get made. It’s doubtful that Wilder would agree to something like that. A less popular fighter obviously might, but not Wilder, especially with how good he’s been looking lately. He arguably beat the #3 fighter in boxing with his knockout win over Luis Ortiz last year. Fury hasn’t done anything with his comeback yet to put him at #3. As for Wilder’s next fight against his mandatory Breazeale, 33, he says he wants to knock him out and put a hurting on him. Wilder is annoyed by the trash talking that the 6’7″ Breazeale has done in the past, and he wants to thrash him, and get him out of the way once and for all so that he can get to the bigger fights. “I’m gonna run this fool over. You know I bring the pain,” Wilder said during Tuesday’s news conference with Breazeale. “I bring devastating knockouts,” he said. “I can’t wait to see what this fool’s body does when I hit him on his face, when I hit him on the chin. I try to punch through them so I’m gonna grab his brain and I’m gonna bring it outta his head like it’s ‘Mortal Kombat.’ That’s how it’s gonna be. I promise you that,” Wilder said. There a lot of boxing fans that could care less about Wilder’s fight with Breazeale, but he can still make noise with the fight if he gets him out of there quickly by knocking him out. The worst thing Wilder can happen is another fight that goes the 12 round distance where the judges get a chance to score the fight. It was a good move by Showtime to put the Wilder vs. Breazeale on regular, non-pay-per-view on May 18 instead of asking the boxing public to pay to see that fight. If Showtime had put the Wilder vs. Breazeale fight on PPV, it likely would have failed miserably with only a small fraction of boxing fans bothering to pay to see it. The fight the fans want to see at this point is Wilder vs. Joshua. This isn’t a knock on Fury, but he made it really boring last December in fighting to a 12 round draw. A rematch between Wilder and Fury would likely bring in the same PPV numbers as the first fight. The fight pulled in 325,000 buys on Showtime. While are decent PPV numbers, they”re nowhere close to the numbers that Saul Canelo Alvarez vs. Gennady Golovkin fights brought in. Canelo vs. Julio Cesar Chavez Jr. brought in much better numbers than Wilder-Fury. Fury needs to build his name up, and change the way he fights in order for a rematch between him and Wilder to bring in a lot of PPV buys. Unfortunately, Fury is likely going to continue to fight the way he is now, so a second fight between him and Wilder probably do well. Joshua is the guy that Wilder needs to face. If that fight can get made this year or in 2020, it would be great fight for the boxing world. Fury needs to win over a fan base with the U.S fans by beating the likes of Kubrat Pulev, Oscar Rivas, Adam Kownacki and Joe Joyce before he looks to fight Wilder again.